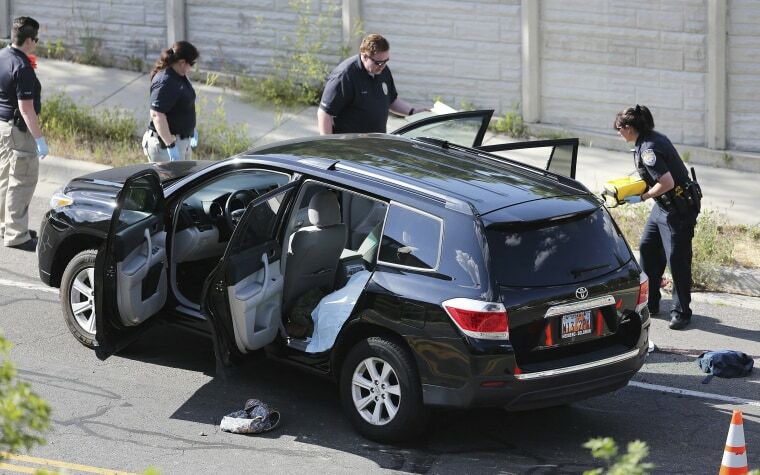 SANDY, Utah — Utah investigators and stunned residents of a middle-class Salt Lake City suburb are trying to understand what led a man to open fire on a woman and children inside a car, leaving the woman, a boy and the man himself dead and two other children injured. Police went out to the area in Sandy, Utah, after getting a 911 call Tuesday afternoon about a domestic disturbance, said police Sgt. Jason Nielsen. They found a bullet-ridden car with smashed windows and blood in the middle of a street next to a second car that police say the suspect used as a ram to stop the first car from leaving the neighborhood. An unidentified woman was driving the car in which the victims' were found. Police say she picked up the woman and two juveniles in a car acting as a "good Samaritan." Police found the man, a woman and a boy dead, and a boy and girl injured from gunshot wounds. Nielsen did not have details about the kids' ages and identities or the name and whereabouts of the woman who picked them up. That woman who Nielsen called a "good Samaritan" survived, he said. The injured boy was hospitalized in critical condition. A girl was hospitalized in stable condition. Investigators were still trying to confirm details about the relationships of those involved. Nielsen did not immediately know if the gunman killed himself or if someone else involved in the dispute had a gun. The shooting occurred in the quiet neighborhood with winding roads, nestled against mountains about 20 miles southeast of Salt Lake City. It took place about a half a mile from an elementary school after students had just left for the day. It was unclear if any children still at the school witnessed the shooting or heard gunshots, Canyons School District spokesman Jeff Haney said. Corbett said he was relieved when his son arrived soon after, coming from the school and in the opposite direction of the gunfire. His son, Anthony, said he wasn't worried because he thought the gunshots were fireworks. Ridge Workman, a 14-year-old boy who lives several hundred yards away from the shooting, said he heard seven to eight gunshots and also thought they were fireworks. When he went outside, he saw a car in the street riddled with bullet holes, its windows smashed in and blood nearby. He called his mother and told her that what was strange was how "eerily silent" it was at the scene.